Put the celery, carrot, cloves and bay leaves in a square of muslin and tie into a bag. Place in a casserole with the vermouth or wine and stock. Bring to the boil. Reduce the heat, cover and simmer for 45 minutes or until reduced to 2-3 tbsp liquid. Add the shallots and mushrooms, bring back to the boil and cover. Simmer for 30 minutes (the mushrooms will give off lots of liquid). Discard the muslin bag. Whisk together the egg yolks and cream. Whisk in a little of the hot liquid from the pan. Slowly pour back into the pan, stirring constantly. Reduce the heat to very low and cook gently, stirring constantly, until thick (10-15 minutes). Do not boil. Season to taste and keep warm. Beat the escalopes between two sheets of clingfilm with a rolling pin until very thin. Season and coat lightly with the flour. Heat 1 tbsp oil in a frying pan over a medium heat. Brown the escalopes, in batches, for about 3 minutes each side. Add more oil as necessary. 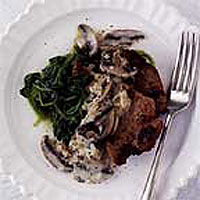 Serve with the sauce, garnished with parsley, with spinach.